The space at the back of this railway arch, opposite one of the schools where John works, is where he makes his compost. He diligently hauls green waste over from the school in a wheelbarrow. If I'm lucky I get a share, provided I go and pick it up. He used to have a large greenhouse where he kept his pots and tools and potted-on succulents but the school is being rebuilt and it had to go to make space for temporary buildings. So now he is annexed to the arches. The floor of the arches is made up of different kinds of stone - granite setts, old brick, York stones on edge and Portland pavers - that look like they have been here for hundreds of years, and probably have. In fact, the arches uwere used as stables up until around the mid 50s, with carthorses housed there. This is what James Lees Milne had to say on 1st July 1944 - "At six I met James and ...we tubed to Aldgate East. We walked down the Commercial Road to the river. God, the squalor, the desolation and the dreariness of the East End." I love reading about the borrowers, and your local environment, and the arches and the green shoots that grow in spite of marauding sheep. Hurrah for rus in urbis! Is this the allotments at Johnson Street, London E1? I grew up near there (was educated by the nuns who live in Hardinge Street convent) and I know the school is currently being rebuilt. Enjoy your blog especially as so much of your London is my London. Awww, bless him. (And John, for taking him new bedding). It's said that home is wherever you lay your hat. Does he have a hat, Man Under The Arches? I wanted to write about a space that falls short of picture book beauty and shiny newness but which has meaning for the people and a perverse beauty of its own. (Stones, bit of a thing of mine) I decided to amend the blog slightly to protect the innocent though. Just in case. And Joan, your London is indeed my London. 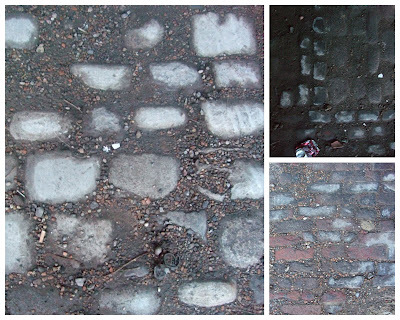 Wonderful cobbles. The West London mews, where I lived in the late 1960s, was completely cobbled as there were originally stables on either side. I just looked at the photos that I took last October of the same street to see if the cobbles had been covered in tarmac - the old mews stables and flats above having recently been converted into luxury townhouses. Yes, it was now tarmac covered, apart from a narrow strip of cobbles which had been left exposed on either side of the street; the only remaining link with the street's former life. compost can bring anything to life. I've been really enjoying seeing glimpses of London through your eyes. I love those moments when the history of the city breaks through all the starbucks etc.